To remove wood finish and paint from wood, you’ll need to use a paint stripper. Different types of finishes use different types of paint stripping techniques, but it is easy to figure out what type of finish you are removing. Removing paint or finish is not difficult, but it is a necessary step for refinishing wood. There are a lot of different paint strippers on the market and some have “environmentally friendly” claims. Not all are the same and some only work with specific types of finishes or coatings. Read the label to make sure you are getting what you need. Basically, there are two different types of paint stripper; Solvent based (flammable) and Caustic based (non-flammable). The solvent strippers will be more powerful, able to remove a wider variety of finishes and thicker layers but have a very bad smell, are flammable and could damage some substrates. Caustic based paint strippers are what the environmentally types are. These are still dangerous to use as they can cause burns to the skin. Typically, this type of paint stripper won’t work as fast or work as well as solvent paint strippers but they are generally safer and easier to use. NOTE: Fiberglass doors can be damaged or destroyed by using the wrong stripper. It is best to visit your local auto body supply store for a suitable fiberglass safe paint stripper. Cars have many plastic or fiberglass parts and an auto-body supply store will have the best products that will work without causing damage. Don’t expect all paint strippers to work well with all paints or finishes, even when they claim to work. This is especially true for the “environmentally friendly” types. A general rule is; old hard oil-base paint will need a strong paint stripper while newer latex finishes can be removed with more harmless types. Heat a very efficient way to remove paint from wood. There are several ways to do this; use a heat gun, low-intensity infrared heater system or a torch. Using an open frame is dangerous so a torch should not be used. But, a heat gun can also be very dangerous. The high heat produced causes noxious fumes and it can cause a fire. On the other hand the low-intensity infrared heater systems are low heat and much safer. The EPA has rules about using heat to remove paint that should be considered. When old lead-based paint is heated it gives off fumes that contain lead, obvious major heath concerns. The low-intensity infrared heater system on the market does not produce the same fumes when used properly. One option for removing paint or finish is by sanding, with either a power or hand sander. This quickly removes paint or finish by grinding down the wood and the finish on the wood. Sanding does remove some of the wood you are working on. For rough jobs or pieces of wood without intricate carvings, this may be okay and not a downside. However, for those pieces of wood with detailed engravings or fine wood, you will need to remove the paint or finish with paint strippers. Different types of paint and finishes require different methods of removal. To test the finish, use denatured alcohol, a substance similar to rubbing alcohol. Some rubbing alcohols are denatured if they include ethanol, but most rubbing alcohol is made with isopropyl alcohol and won’t work for this job. Denatured alcohol will instantly dissolve Shellac and will make water-base paints sticky. Once denatured alcohol is applied to Shellac, the Shellac and alcohol can then be wiped off. 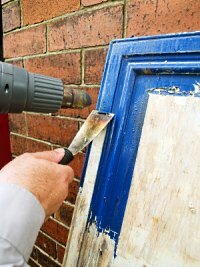 Most water-based paints will require a mild paint stripper for complete removal. Oil paints, however, aren’t affected by denatured alcohol, making it clear what type of paint you are dealing with. For oil base paints, you will need a chemical paint stripper. If your wood has a clear finish, use lacquer thinner to test what kind of finish you are encountering. Lacquer thinner causes lacquer to cloud. If the lacquer isn’t wiped away, it will regain its clear gloss once the thinner evaporates. If the finish cracks, you are dealing with varnish or polyurethane. These will require varnish remover to take off the finish. Each paint stripping technique differs depending on the wood and the paint or finish. The easiest method is sanding, which roughs up the wood to remove anything on top of it. However, using a paint remover can protect wood with finer details or carvings. Denatured alcohol removes Shellac and makes it easier to wipe away water paint. Oil paints and clear finishes, however, require special chemicals to strip the paint or finish. I live in an old house, where ALL the woodwork is faux painted to look like oak. It is well over 100 years old. Thank goodness no one painted it! – Well except for my one problem. Someone painted the inside of the bathroom door with white latex, then stenciled grapes all over it. Yuck! I want to remove the latex without harming the faux. There are many coats of varnish over the faux. I am afraid to try anything at this point, except maybe the heat gun; but I know that won’t take it all off. It’s a two over two panel, with a horizontal panel in the middle. ANY suggestions would be appreciated. This is a tough one; On one hand you want to remove the paint but not damage the faux wood grain. I would start out with a mild stripper and be prepared to act quickly to remove it and the paint. Soy based strippers should do a good job but any paint stripper could take too much off. Have the tools handy, plastic scrapper, scrubby pads and a pail of water to remove the stripper if it acts to aggressive. Also, test a small area before committing to the entire project, some experimentation will be needed to get the right product and technique needed to do this. Your comment, ” When old lead-based paint is heated it gives off fumes that contain lead, obvious major heath concerns”, isn’t entirely accurate. It should be noted that the paint would have to be heated above 1,100 degrees F in order for the lead to be vaporized. The heat gun can be used, as per EPA regs, provided it’s done at temps below 1,100 degrees F.
And, your statement, “Caustic based paint strippers are what the environmentally types are”, is absolutely incorrect. Perhaps a correction or revision should be made? Oak kitchen cabinets that are Varathaned, how do I stripped them? Using a chemical stripper will be a good starting point. This can remove the clear finish and some stain if present. Some sanding will be needed after the chemical stripper is neutralized and the surface is dry.